Laporte said he charges $70 CPMs for ads. Some questioned the $12 CPM we included in our New Business Models for News, though we went with a conservative middle-ground based on the experience of existing local businesses. If we had – as we will – instead forecast a new kind of local news business – highly targeted with a highly engaged public, like TWiT’s – the CPMs and bottom lines would have been exponentially higher. The companies are still small but they are profitable. Laporte said he has costs of $350,000 a year with seven employees now but revenue of $1.5 million and that revenue is doubling annually. It will increase more as he announces new means of distribution (to the TV; he believes that podcasting is too hard for the audience). Rather than nickel-and-diming current business assumptions, we need to have the ambition of a Laporte and build the new and better media enterprise. Last night, son Jake and I went Diggnation’s first New York — first East Coast — show. It is amazing, just amazing what these guys have built. Jim Louderback, the nicest CEO I’ve met in media and the head of Revision3, which produces the show, said that 2,000 people showed up and hundreds of them waited outside in the rain for the chance to get in. For these guys, Jake included, I think it is their generational and geeky equivalent of getting into a small club when the Stones came to town for my generation. And I am of a different generation. I was no doubt the oldest guy there, which either made me very hip or very out of place. I was also apparently the tallest guy there. White hair sticks out at 6’4″. Some illogical geek behind me kept poking my back until I turned around and he told me to move over so he could see, which of course would only block some other short geek’s view. And there was absolutely nowhere to move; it was jammed up there in the Digg mosh pit. But you’re tall, the complainer said. Genes, dude, I said. But I didn’t feel out of place. I watch Diggnation and know enough of the shtick. I’m a fan. Before the show, Jay Adelson, president of Digg and chairman of Diggnation, came on stage to talk about Digg, not for very long. They said they are getting (as I remember) 26 million uniques a month. There are one million Digg users in New York alone. Last night’s crowd was a tiny but enthusiastic fraction of them. Though, of course, the media and circumstances are quite different, for comparison’s sake, that’s about the circulation of the New York Post or Daily News, both of which are bigger in New York than the Times. Rose and company have built a real media enterprise from nothing but technology. What’s notable to me, more than its size, is the passion and loyalty of its audience, which was what was most evident last night. Could you imagine 2,000 fans standing in the rain for the chance to watch your local anchorman or hear your local editor? Is it possible for old media to inspire this kind of passion? I’m not saying it’s impossible; indeed, I’ve suggested that the Guardian should hold meetups and events in the U.S. to demonstrate to other media and marketers just how loyal their audience is. On the ride to Brooklyn, Jake and I listened to the latest TWiT podcast. Louderback was also on that and he and host Leo Laporte reminisced about their days on TechTV and how, from the closet in his home, Laporte is also building a media enterprise that rivals their old company in audience and is certainly one helluva lot cheaper to produce. Louderback also talked about the economics of internet TV vs. basic cable and the ability to focus in on a smaller and better audience and serve them well. That’s what these shows do. 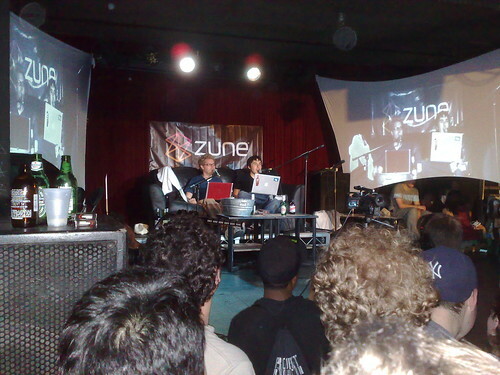 During last night’s show, Zadi Diaz and Steve Woolf also announced that they are moving their Epic Fu show from Next New Networks (which is still a long way from its goal of 100 networks) to Revision3. It’s turning into a media empire. And Kevin Rose is its Rupert Murdoch.